The cel-shading is so good that this doesn’t look like a photo. It looks like a 3D render that’s trying to look like a photo. 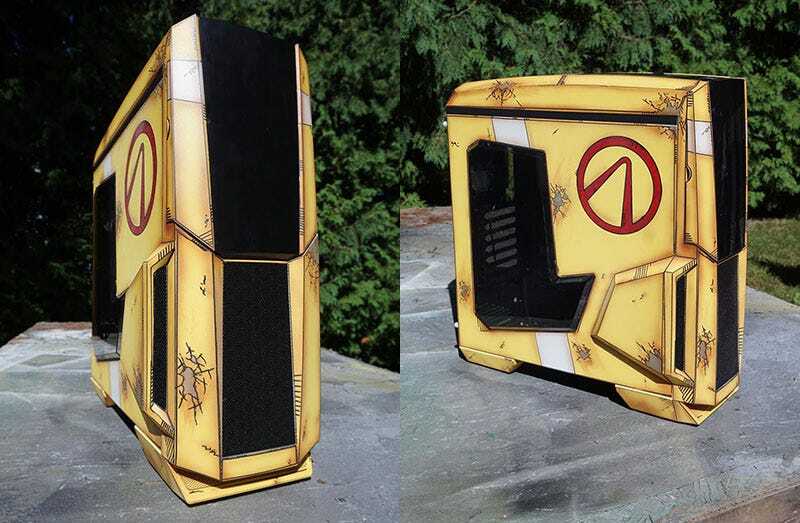 It’s a custom build by Ford Ashton, a friend of drummerdks and, for now, it’s just a case, with no actual PC inside. Which is probably for the best. You don’t want to hide this under a desk while you use it, like a peasant. You’d want it on a shelf somewhere to show it off. Ford says the case is actually a gift for drummerdks’ girlfriend, whose favourite series is Borderlands. Her old desktop was fried a few weeks back, so this is a very nice replacement. (Ford’s taking commissions for future projects, so if you like his style, you can hit him up here).